It’s cold and frosty outside, the perfect weather to get you in a festive mood. 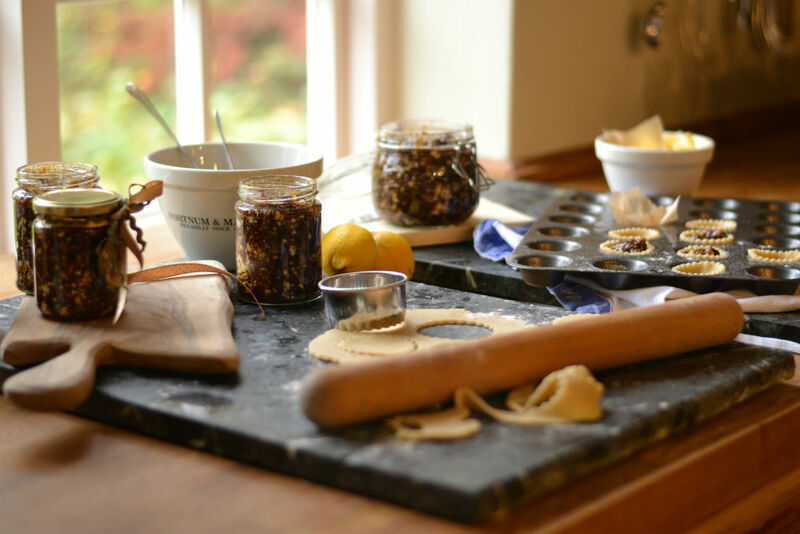 Stir up some homemade mincemeat, packed full of Christmas flavours that will remind you of childhood celebrations and seasonal gatherings. Then get set and be prepared ahead of time, as you make this coming 25th December another family favourite. To cook in a 2-oven or 4-oven AGA – slide grid shelf of roasting oven to lowest set of runners. Place the cooking apples on a baking tray lined with parchment. Bake for 25 – 35 minutes until soft. Allow to cool, remove skins and place pulp into a mixing bowl. Add all of remaining ingredients and mix well to combine thoroughly. Pot into sterilized jars and seal. Label and date. Bake a few extra apples and mix a plum pudding as well. This will store well and mature in the larder ready to re-heat gently on Christmas Day. To sterilize your jam jars we suggest that you wash them thoroughly in hot, soapy water and then rinse well. Place them in a preheated oven for twenty minutes at 100 C. Allow to cool slightly before adding the freshly made mincemeat and make sure to seal with new lids. These can be purchased easily online and good cook shops. Sealed jars should keep up to six months in a cool, dry larder. Make a few extra jars to give as gifts. Waste not, want not – as Grannie would say! If you have any leftovers, add this to your favourite fruit cake recipe or use it to stuff baked apples for a quick pudding. Fold a generous tablespoon into whipped cream, along with some crushed amoretti biscuits for a decadent dessert. Alternatively add a freshly grated dessert apple and a few leaves of finely chopped sage, mix well to create a stuffing for a boned leg or shoulder of pork. Grease the insides of each pudding dish with a little butter and cut a round of baking parchment to fit the top of each. This will act as a lid over the inside of the mixture. If there is time, place all of the ingredients in a bowl with the brandy and leave to plump overnight. In a large bowl, cream the butter and sugar together well, then add the apple puree and marmalade. Mix until combined. Add the remaining dry ingredients and continue to mix together. Add the soaked fruit and find a helper to take over with the mixing! Or put the kettle on and take a break. Continue to work everything together after you have had a lovely cup of tea. Grease the pudding bowls with butter and fill with the pudding mixture. Cover the mixture with your piece of baking parchment and then put another larger round over the top, followed by a round of brown paper or foil. Secure well with kitchen string that should sit under the rim. Place a cooling rack inside a large roasting tray and half fill with hot water. Place the pudding on the rack and then ensure that the water is half way up the side of the basin. AGA method – slide the grid shelf on the floor of the oven and carefully place the pudding in the roasting oven. Leave for 30-45 minutes and then transfer to the simmering oven. Remember to check that the water is kept to the same level throughout cooking. Depending on the size of your pudding, leave to steam for 6-8 hours or overnight. Set the temperature to 120 C or gas mark 1 and follow the AGA method above. You will have to keep the water level monitored and wipe the inside of your oven every couple of hours but it is better than having a kitchen full of steam! If you prefer to cook on the hob, place your pudding on a trivet inside a saucepan and then fill the pan one third full of just boiled water. Steam for 8- 10 hours and remember not to let it boil dry. Follow the cooking instructions above but simply re-heat for one and a half hours. Serve with brandy butter and clotted cream.